Turkey tail mushrooms are so named because they really do resemble the colorful striped plumage of a turkey’s tail. Less popular in the West, the Chinese have been using them to make medicinal teas for centuries. These mushrooms belong to the family – Tramets versicolor. Aside from their valuable effects on health, they are an important ecological fungus which help decompose hardwood. When it comes to their health benefits, they rank alongside more familiar mushrooms like cordyceps, reishi and maitake. There is a growing body of modern research into their health benefits with some exciting findings regarding their ability to help patients undergoing cancer therapy. Turkey tail mushrooms were used during China’s Ming dynasty in the 15th century. The Japanese are also familiar with the mushroom and its therapeutic value. In japan, they are referred to as kawaritake meaning ‘cloud mushrooms’ because of the mushroom pattern’s resemblance to swirling clouds. In Asia, the mushroom is specially well-known for its ability to boost immune system health but as you will find out, these mushrooms offer so much more. These amazing mushrooms grow throughout the world in forests, under fallen trees and on stumps. Despite their benefits being relatively unknown in the West, they are actually among the most common of mushrooms found. Take a look for yourself, wherever there are trees, there is a good chance you will find wild turkey mushrooms. 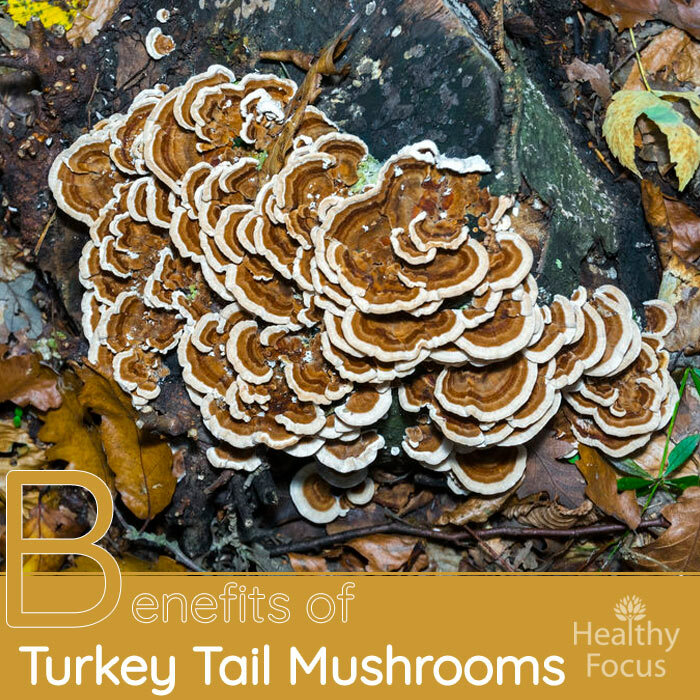 Turkey tail mushrooms provide your immune system with a powerful boost. They contain polysaccharides and B-glucans within the walls of the cells. When they are consumed, these B-glucans help boost the immune system by the way they interact with the small intestines. Because of this, turkey tail mushrooms are regarded as a wonderful natural adaptogen. Adaptogen herbs like these mushrooms help the body cope with the many stress factors it encounters on a constant basis. They boost immune health and stimulate energy. Mushrooms are low in fat and a packed with healthy nutrition including vitamin B and D, various minerals, proteins and polysaccharides. Their mycelium structures are loaded with various therapeutic properties including antioxidant, antiviral and antibacterial agents. Turkey tail mushrooms have antiviral properties that can help combat various infections including the viruses responsible for the flu and common cold. They also help by boosting the immune system helping your body ward off those annoying illnesses that many people suffer from on a regular basis. Studies into the effects of mushrooms on cancer are ongoing but preliminary research indicates that they may have a role to play in preventing this terrible disease. Researchers believe that the way in which turkey tail mushrooms and various other mushrooms strengthen the immune system is key to their ability to fight cancer. Several reported case studies have noted that taking turkey tail mushrooms alongside traditional cancer treatment helped improve the effects of chemotherapy. As well as potentially helping treat cancer, turkey tail mushrooms might help patients undergoing chemotherapy. The FDA has already conducted rigorous clinical trials to examine the effects of an extract of the mushrooms on patients in the advanced stages of prostate cancer. They have also looked at its effects on women undergoing chemotherapy for breast cancer. Turkey tali mushrooms taken in tea or extract form may help improve your digestive health and help your digestive system work more effectively. Mushrooms contain mycelium and certain prebiotic compounds that can improve the microbiome and help beneficial bacteria grow in the gut. This good bacteria includes bifidibacterium and acidophilus which can also help people with common gut conditions like leaky gut syndrome. Improving your digestive health may even help you to lose some weight over time. Mushrooms like the turkey tail mushroom have antiviral uses and research shows they could be useful against certain viral infections like HPV or the human papillomavirus. Turkey tail mushrooms look magnificent but the same can’t be said for their texture and taste. They are edible but are very chewy so they are more often used in powder and capsule form. You can also find turkey tail mushrooms combined with other healthy mushrooms in the form of capsule supplements. When you are shopping for turkey tail mushrooms, try looking for organic produce. This ensures that you avoid the toxins present in the soil. One of the reasons mushrooms are so good for you is the dirt in which they grow contains plenty of nourishment and you want to take advantage of this so buy organic. Also try looking for a product that has been validated in scientific studies. Try doing as much research as you can before buying any supplements to find out where the mushrooms were cultivated. As well as buying turkey tail in supplementary form, you can try using your mushrooms in a home made recipe like a healthy tea. Again make sure that you are using the best quality, organic mushrooms. In order to get the excellent immune boosting benefits of the tea, you recommended to drink one or two 8-ounce glasses of tea each day. In order to get a palatable mild flavored mushroom tea, make the tea in a 1 to 5 ratio of mushrooms to pure, clean water. Here is an excellent recipe that combines turkey tail mushrooms with the incredibly healthy turmeric. This tea can boost your immune system and help treat a multitude of inflammatory conditions. Together, turmeric and turkey tail make a very powerful combination. One cup of chopped mushrooms. Five cups of pure water. Lemon and honey to taste. Chop the mushrooms into little pieces then add them to the water in a pot. Bring your water to the boil and simmer for an hour or so. Add your turmeric and the honey and a little lemon. You can drink hot or chill for a refreshing healthy drink.